Prelude: Once upon a time there were three brothers, all of them named after the land. The eldest was called Landmine of the Energon line and he came into the possession of this humble reviewer in the distant past of 2004. The youngest was called Landshark and he emerged from the elite lineage of Botcon, appearing in 2009. The middle brother, however, though nearly of the same age as the eldest, remained hidden for long, only rumored to appear in the accounts of the Dreamwave. It was not until the waning of the year 2018 that this brother, called Landquake, finally appeared. And as it has been a near-decade since I last gazed upon this mold in a review manner, we shall now deign to do so again. Robot Mode: Landquake consists of two separate modules, one being the actual robot, the other a trailer that becomes a power-up for his so-called “Brute Mode”. The normal robot mode is about Voyager-sized by today’s standard and looks pretty cool. I love his big, stompy feet and those triple exhaust pipes on his shoulders. Landquake is very nicely articulated for a figure from 2004. No twisting wrists or hip, but everything else moves and he can pull of some cool poses, including kicking other robots in the face with those huge feet of his. Landquake doesn’t carry any hand weapons, but if you want you can swivel those triple exhaust pipes forward to basically give him guns. Side note: Something that has only occurred to me once Landquake got here, this robot would have made a very good Prime. The normal robot is the pre-Matrix version, the Brute Mode is the powered-up one. I think this figure would have made an awesome Rodimus Prime or Nova Prime. Landquake’s Brute Mode applies the two tank tracks and claws to his arms and the platform with the crane and missile launcher from his vehicle mode to his back. Wings flip up behind his head and his head is framed by two weapons (or one weapon and a crane). The results looks extremely cool and powerful. Landquake retains his full poseability, hampered only slightly by the bulky arms. Sure, his head is pretty much encased and he’s got zero side vision, but I’m sure a robot can compensate that somehow. The only very, very slight downside of this awesome robot mode are the heels, which aren’t the most stable in the world and can easily flip in. He’s got a solid stance if the heels are in the right position, though. So bottom line: an awesome robot, with or without the Brute Mode. Alternate Mode: Landquake’s robot mode transforms into a truck with a big snow plow up front and links up with his trailer, which gives him a towing crane and a missile launcher. The combined vehicle mode looks like something from a Mad Max movie (if it were dirtier and rustier, mind you) and I really, really like it. You can turn the platform on the rear bring the crane arm and missile launcher into different positions, too. The towing hook from the crane is on a string and can be pulled out a good bit, retracting when you push the button on top. So bottom line: a superb vehicle mode. Landquake’s trailer can also become a sort-of battle station. It basically rises up, using the tracks and wings as legs, allowing robot mode Landquake (or a similar-sized robot) to stand behind it as a gunner. Not the most intricate base mode ever, but pretty good. Remarks: Like in most toy lines the Energon line, too, saw many of its toys repainted in order to reuse the molds. Interestingly enough many of those repaints actually did appear in the cartoon, usually as powered-up versions of the same character, even when the toy got a different name and profile. 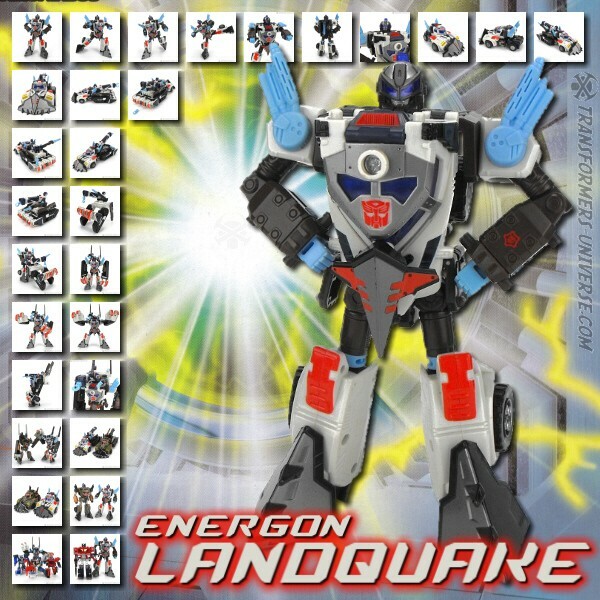 Landquake was one such case, the toy being described as a separate character, but appearing in the cartoon as a powered-up version of Landmine. Landquake did appear as himself only in the pages of the Dreamwave Energon comics (though with an entirely different head mold), where he was part of the Autobot force defending Earth from a massive Terrorcon attack. Having already owned Landmine and currently owning Landshark, I didn’t really plan on getting Landquake, too, but when I saw him for a steal on ebay, I couldn’t resist. The Landmine mold is, to me, one of the best molds from Energon, probably the best Autobot mold, and simply a great figure. I’m not sure which paintjob I like best, but Landquake definitely looks very good. So bottom line: a great figure. I recommend having at least one version of it in your Transformers collection. This era, despite many issues, did manage to pump out some exceptional looking figures from time to time and this is one of them. He looks great and plays great, two hallmarks of TF at it's finest.